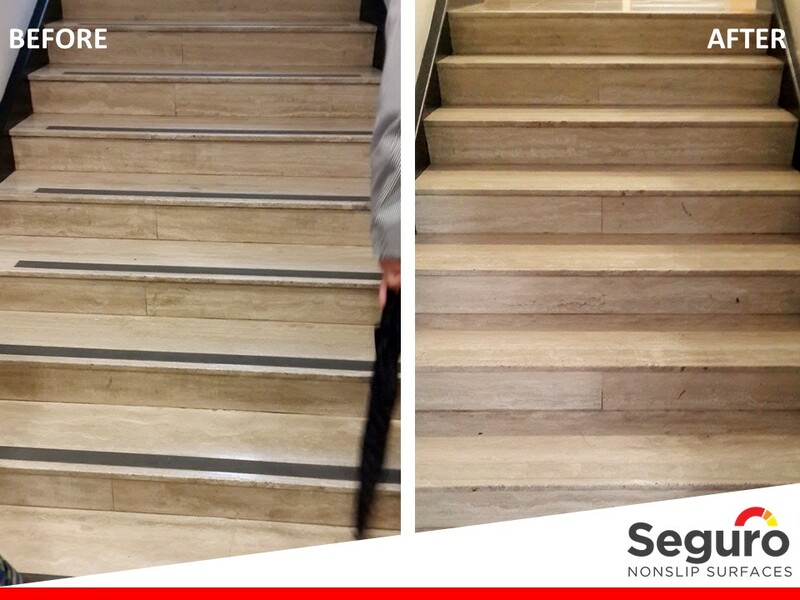 Seguro Nonslip Surfaces takes the ugly out of safety by using aesthetically pleasing solutions for slippery stairs. 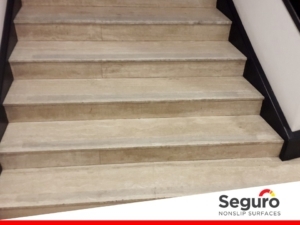 Our client takes safety very seriously and has applied every measure possible to ensure the safety of employees and visitors using these stairs. It was time to replace the worn black anti-slip tape and we opted for a clear, mop friendly anti-slip tape. Using the clear, mop friendly anti-slip tape compliments the beautiful natural stone tile, adds slip resistance to the stairs and is easy to clean. Replacing the black tape with the clear tape also brightened up the staircase, giving it the appearance that was intended when the tile was selected for this area.